The observations of a young U.S. Marine in France in 1918, during the final months of World War I and the first few months of the Armistice. Private Richmond served with the 43rd Company, part of the 2nd Battalion, 5th Marines, and kept a diary during the war. He was a member of the American Expeditionary Force that joined the war in the summer of 1918, and helped to bring it to a conclusion that fall. He was promoted to corporal and stationed in Germany for a portion of the occupation. 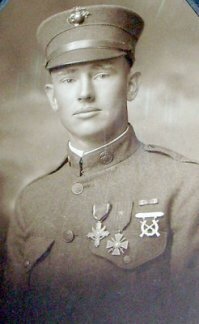 He was awarded the Distinguished Service Cross, the Navy Cross, and the French Croix De Guerre for his heroism on October 3, 1918, in the assault on Blanc Mont Ridge during the Battle of Somme-Py, described in episodes 14, 15, and 15. (See also this photo tour of the Blanc Mont battlefield and this description of the battle. ) After the war, he returned home to Cleveland, Tennessee, where he compiled his memoir, raised a family, and lived until 1981. His original memoir, uniform, and other memorabilia are on display at the Museum Center at Five Points in Cleveland, Tennessee. Note: I have begun a Google Map that follows the war diary from the time he landed in France through the "Watch on the Rhine". There are lots of holes in the middle, especially in July through September, when he moved around the front without being specific about location, and in mid-November through mid-December, during a long march from the Meuse to the Rhine. I don't (yet) have links to it from within the diary; just here.